As promised, a photo from our day at the zoo last Saturday. Most of the animals were hiding, but thankfully the reliable giraffes (Marlie's animal) were at the feeding trough and ready for some fun. Great picture! I'm not too keen on animals but I just might pet a giraffe. I think they are wonderfully oddly cute - or maybe I've seen that commercial with the miniature giraffe one too many times! Awww! Priceless! She's an adventurous girl. I'm like keyalus, I'll pass on the pet petting. My kids love it though. That's an awesome picture Teresha! What fun for all of you :) Hope you had an amazing Mother's Day!! What a sweet shot! Visiting the zoo is always fun, but it is nice when the animals are out. I am glad she got to see her giraffes. That is awesome! 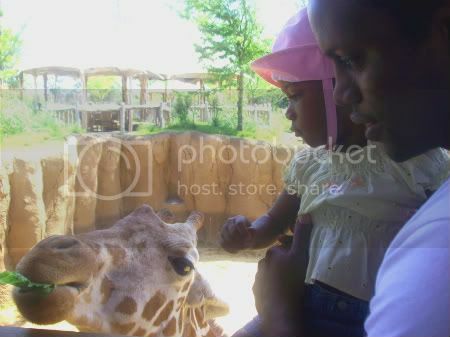 That girl has great taste in animals, I love the Giraffes and the Okapi. I love this picture of the two of them! And what a great thing to be so close to this famous animal! Oh I so love it! What a great picture!